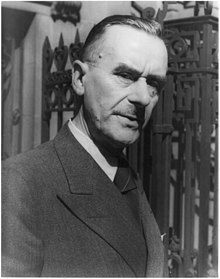 Paul Thomas Mann (born 6 June 1875 in Lübeck; died 12 August 1955 in Zürich) was a German author. Mann was born in 1875 in Lübeck as son of a salesman and senator of the city of Lübeck, into a rich and conservative family. In 1891 his father died. In 1894 Mann left school. He went to Munich, were his mother and his brothers and sister had been since 1893. He worked as an insurance salesman and wrote poems and prose by the way. In 1898 he published his first works and began Die Buddenbrooks, published in 1901. In 1906 he married, although he was not clear about his sexual orientation. In the World War I, Mann agreed with the war, but not enthusiastically. In the time of the Weimar Republic he defended democratic ideas. In 1929 he won the Nobel Prize for literature. In 1933 the Nazis burned books of his brother Heinrich Mann. Because of this both Thomas and Heinrich and their family moved to the United States in 1934. He lost his German citizenship, but got Czechoslovakian citizenship in the United States. In 1944 he became a US citizen. He worked for the Allies in the radio during the World War II. In 1952 he had to give a talk to the Committee on Un-American Activities. He was very disappointed in the United States and returned to Europe, to Switzerland, in 1953. In the 1950s he visited Germany sometimes. He died of atherosclerosis in Zürich, Switzerland. Wikimedia Commons has media related to Thomas Mann. This page was last changed on 28 January 2018, at 07:11.